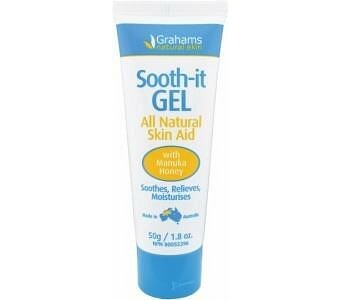 Grahams Soothing Gel, a natural alternative to "sting-goes". A natural product designed to relieve the discomforts of insect bites and minor cuts and burns. Benefits: Relieves irritations without the use of harmful and irritating chemicals Effective in relieving discomfort from misquito bites, midgees, insect bites, bee stings, minor cuts and burns Non irritating formula is especially suited to people with sensitive skin. Use: Simply apply to affected area as required. Suitable for any age group. As with any product it should be patch tested prior to use. Ingredients: Centella Asiatica ext, Calendula ext., Manuka Honey, Chamomile, Emu Oil, Witch Hazel, Aloe Vera, Allantoin (Comfrey).